9/27, I called Feds (USDOJ) at approx. 1;40 PM reporting the dual 2 blk 'chertoff' electric chair glare conspiracy (I also e mailed a report) - cnn.com [(abcnews.go.com)] Jacksonville Jaguars players lined up protesting anthem, 2 pairs of players leaning over & glaring at camera, same as Chertoff did during Bush admin. ([Davis] chair [(mayor) is] tough,' [because it's electric] chair [&] tough [luck] or [exercising like crazy with your] shirt off.' Additional facts: [...For several years I had] a link to a picture on my War page with 2 blk boys looking up (bb players); no 'T-ooo' code (I don't use codes); the implication was only that 2 boys looking up is better than one. But it became a 'T-ooo' code & was used by blks, as reported. I left post office, & when I arrived at intersection of Pole Line & 8th, & in front of me was a car with 'Galpin' lic plts; & at intersection, 2 blk boys waiting to cross, one blk shrt one maroon. At Groc. Outl pkg lot, [...] before I left, a car located next to mine, lic pl 3BOYKIN, 2:08 PM. Also, male choir director at First So. Baptist Church in 1989 (now Pole Line Rd. Baptist - one of the conspiracy churches), located at 8th & Pole Line, moved to Ariz. due to allergies, name was Gilpin. 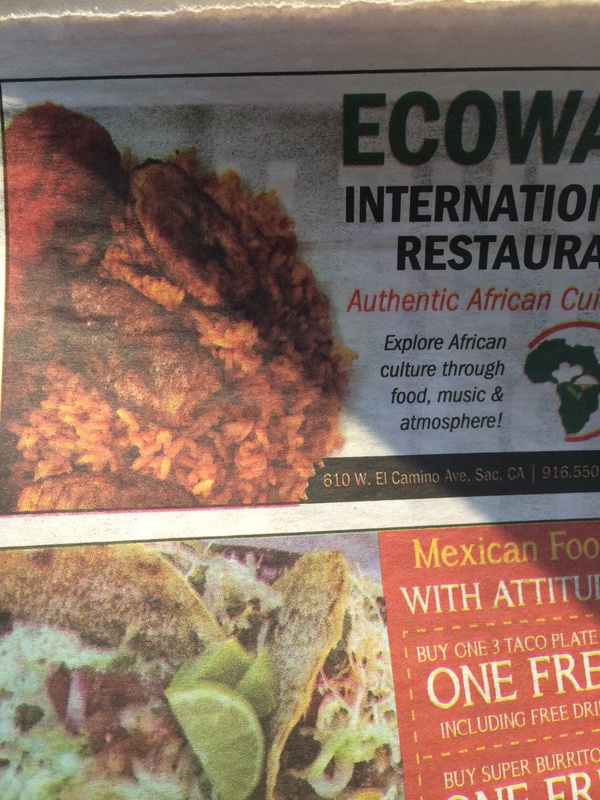 Ad in 9/28 issue of SN&R, p 21, Ecowas International Restaurant, "Authentic African Cuisine," & I happened to notice the meat & rice dish looked like a sheep with wool, wearing an oven mitt, & holding a loaf of bread. My job at Davis Bread & Desserts ended when I called police on blk male emply named Julius in May of this year, who was conspiring with Tom, the owner, & the threats & conspiracies were systematic enough to be effectively drawing a line to call police. I had already consistently reported plots of owner & all employees to Feds; Julius (from Sacramento) had made gestures daring me to attempt to arrest him. The picture included in the ad wasn't available on SN&R's website, & in fact where it should've been, instead there was a "sweet" message. This same weekend (as the ad in SN&R - Sacramento News & Review), there was a restraining order hearing (supposedly Yolo court now has hearings on Sat. 's); they obtained a TRO against me claiming I was disrupting, because I was telling other customers to stop stalking me. The majority of Panera managers & employees, as far as I know, are from Sac. I considered appearing if nothing else, to argue to refuse the 100 yrd. distance from Panera, because that blocks out a huge section of downtown (there was 0% chance the judge would decide in my favor as far as denying the order overall); after a dream, I avoided the hearing. Panera cafe's logo is a fem. holding a loaf of bread close to her - like a baby - the same as the picture of the meal in the Ecowas ad. In other words, Sacramento rebels conspired to ban me from a cafe, &, for the last 6 years, instead of hiring me despite thousands of job applications, mostly for Teacher positions, they not only conspiratorially denied me work, when I was finally hired after 5 years, they sent a conspirator as a coworker stalking & threatening me at work, to eliminate my employment. The ad's message demonstrates both conspiracies...The Ecowas logo is a lg. red crescent on wh. background, circling most of Africa. A chef's hat looks almost like a kernal of pop corn or a wh. 3 leaf clover. 'Ecowas' may be code for 'he co[mpany] was;' or 'he cow [h]as;' the crescent is similar to Turkey's flag symbol - wh. crescent on red background; possibly part of the conspiracies claiming that if I battle to expose & defeat the corrupt American churches that are preventing me from teaching (so that I can be a Teacher), I'm using promoting, & that's sales, & that means I must be in bed with the Davis rebels, with secret motives to have them as clients (that ignores my insistence on use of the H bomb against them). Additionally, I recently reported fem student with dog & wh sun glasses circling me at Civ. Pk while I was juggling 1-2 weeks ago, & sm girl that went by on bike before that with wh sun glasses, as well as the plot involving wh sun glasses possibly involving Obama (according to evidence) in 2009. The fem made an almost complete circle around me; conspicuously coming short of completing it, assuming I wouldn't report her due to that (but it was conspiracy with yolo deputy d.a. 's conspired "restraining order" in 2004 that banished me from UCD campus for 3 years, & also that was void, due to failing to completely describe the limits of the area I was banished from - a partial circle with a gaping hole on SE side of campus (it was also void for being unconst. - banishment is unconstitutional in & of itself) - the judge approved the order despite it being unconst. as well as the boundaries forming an incomplete circle.